Sunday 16th july, 10am - about midday. morning tea will be provided by the EMRC. We will be planting around 1,100 native seedlings near the helena river. Tools will be provided, but please bring your own gloves. water and maybe a bucket. From the entrance, follow the signs and pink flagging tape till you reach the site (same site as 2 July planting day). The Lower Helena Association Inc. was inaugurated in March 2012. But it was only after the final acquittal of the 2012 SALP grant was completed in March 2013 that the association was able to take over full responsibility for our landcare duties. The work of the LHA is to control weeds, to plant fauna habitat along the foreshore reserve of the Lower Helena River and to plant rushes in the storm water drains, along the banks of the river and in the river bed. We work mainly on Western Australian Planning Commission land and we do so in close cooperation with Tony Pantano, Senior Field Manager for the commission. Tony Pantano, as Senior Field Manager, is responsible for managing the whole area and is fully informed of our planning. Often, we are able to integrate the work so that grant funds and Tony’s budget pay for different elements of the same operation. The East Metropolitan Regional Council provides, on behalf of the member city and shire councils, considerable support in a number of ways to all the landcare and revegetation organisations such as ours. One of the most valuable services provided is the system of attachments. This year, we have been ably supported by Environmental Projects Officers (formerly, NRM Officers) Miroslav Vujaklija and Jaya Vaughan, who make important contributors to our organisation by providing help, guidance and educational tools. We value their contribution. The number of ‘follows’ and ‘likes’ we garner continues to grow and is currently at 31 ‘follows’ and 30 ‘likes’. This year, we received a grant of $17,042 to extend our revegetation work at two sites along the Helena River - West Parade and Amherst East. We have been able to provide plants to one of our supporting schools this year. Woodbridge Primary School will be installing rushes and sedges at Amherst East. Unfortunately, we did not receive any funding this year for sites near Guildford Primary School. Sunday, 2nd July, 2017: Members and friends planted approximately 1,500 seedlings, funded by SALP, at our West Parade site. Sunday, 16th July, 2017: Members and friends planted another 1,100 seedlings, funded by SALP, at our West Parade site. September - November: Woodbridge Primary School will plant 1,000 rushes and sedges, funded by SALP, in the banks of the Helena River at the Amherst East site. 4. Installing 300 shrubs and 700 rushes/sedges at Hill Street North, Guildford. 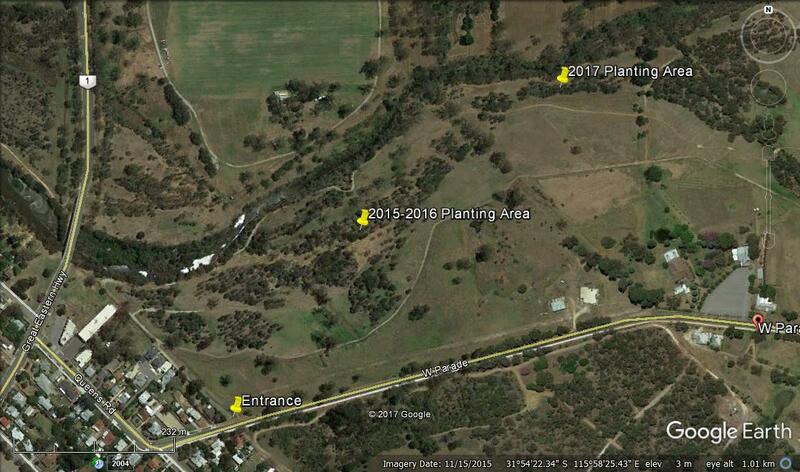 Beyond 2018, the LHA is planning on jumping the river and undertaking revegetation activities around the polo ground in Guildford. Members and friends of the Lower Helena Association can be proud of the work that we have completed. We have achieved very high plant survival rates at all of our sites, with some of our earlier planting areas now providing dense habitat for fauna and impressive floral displays at certain times of the year. Thank you to all contributors.